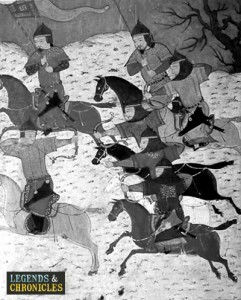 The Mongol Warriors were fierce and well schooled in the art of war. From psychological attitude and organised formations to a variety of weaponry and efficiently produced armour. The Mongols were a force to be reckoned with. 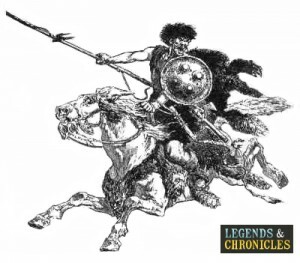 Skilled archers and horse riders, the Mongolian warriors went up against better armoured opponents and used their battle wiles and tactics to give them a fight advantage. The Mongols were rightly feared opponents in battle. The Mongol learned a lot of their battle skills from their ancestors, and every Mongol, warrior or not was skilled in the use of the bow and arrow, often with deadly accuracy. The training was hard and consistent for them but was not overly strict or disciplined in its routine. Their armour for the time was not as advanced as some, but their production of steel was good and workshops were used to produce the weaponry and armour that the Mongol used in battle. The Mongol Warrior would fight in an almost regimented fashion with the troops being divided into 10′s, 1-00′s and 1000′s with leaders assigned. Using these formations they were able to use their ranks to separate tasks, from firing the enemy with volleys of arrows to skirmish attacks. From here they could either advance or retreat firing more arrows or move in closer to use their melee weapons to finish their enemies off. The Mongols horses were equipped with stirrups previously invented by the Huns yet relatively unused in other cultures. By having a solid grounding on the feet while riding it allowed the Mongols to twist and contort while firing their bows and arrows giving them a distinct advantage in fast ranged combat. The Various enemies called for different tactics and the Mongols would use their mobility to employ their advance and retreat bow skills to out manoeuvre stronger opponents. The armour of the Mongol troops was a mix of materials, based on foundation layers of boiled and hardened leather. Steel plates would be added for extra strength in the chest and other parts of the body like the boots and arms. A mix of light and heavy armour would give the Mongols protection against various attacks, while allowing them the flexibility they required to handle their bows. The Mongol armoury comprised of a variety of bows for reaching a multitude of targets with special ‘howling’ arrows used to disorientate the enemy and cause panic.